Comments: Bruce's Drug Store began on November 1, 1908, under the name of Scottsville Drug Company. Dr. Luther R. Stinson and Dr. Benjamin L. Dillard, practicing physicians in Scottsville, maintained a small medicine shop in the town's old apothecary shop on Valley Street (now 510 Valley Street). Finding it inconvenient to keep their shop open as much as the public demanded, the two doctors advertised for a full-time pharmacist in a Richmond newspaper. Thomas Ellison Bruce was working as a pharmacist in Newport News and answered their ad. Ellison and the two doctors formed a partnership in a pharmacy business called the Scottsville Drug Company. 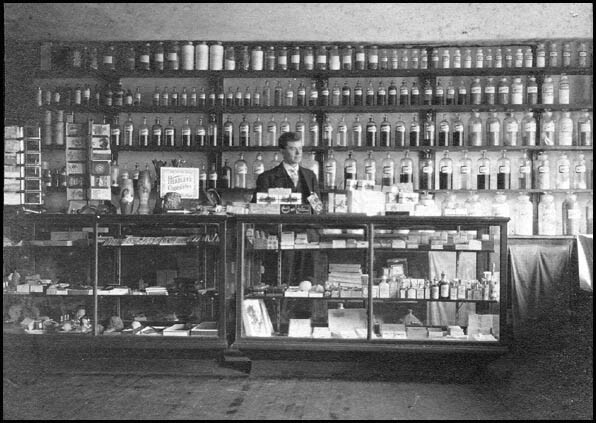 In the 1908 photo above, Ellison is shown standing behind the pharmacy counter of this drug store. The medicine bottles behind him held the medicinal supplies Ellison used to fill prescriptions. Although only twenty years old, Ellison realized the two doctors greatly needed a pharmacist to help them. He drew up a partnership agreement in which each doctor assumed the financial responsibility for his patient's medicinal charge accounts. If the business operated at a loss, the partnership agreement required the two doctors to personally pay Ellison a salary. Dr. Stinson stated, "After conducting business under this arrangement for one year, we realized Bruce was the only one making any money!" The two doctors soon sold their interests to Ellison, making him the sole owner of the Scottsville Drug Company. The photo at left shows the building that first housed Ellison's drug store at 510 Valley Street; this old apothecary building was built ca. 1832. About 1911 or 1912, Ellison moved his store to the Pitts Building on Valley Street (now 330 Valley Street). The photo below at left shows Lee Bruce, Ellison's brother and store clerk, in white shirt and leaning casually against the Scottsville Drug Company's front display window. 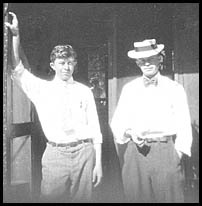 At right, Lee and Ellison pose for a 1913 Kodak snapshot on the drug store's front steps. In the store's early days in Scottsville, Lee helped his brother cover their long hours of daily operation for several years. The drug store opened seven days a week, although Sunday sales were for medicinal purposes only. In the early 1920's, Ellison changed his store's name to Bruce's Drug Store. In late 1927, Ellison purchased the old Carlton House hotel, which was the building next door at the corner of Valley and West Main Street. After extensive renovations, Bruce's Drug Store moved into this building in 1928 and continued in operation at that location until November 22, 2003. 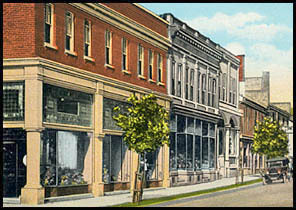 Shown below is a 1928 Burgess post card of Valley Street, which shows the newly renovated Bruce's Drug Store in the red brick building at photo left. The photo at right below shows an interior view of the drug store during its September 1928 grand opening. In his store's early days in Scottsville, Ellison ordered his drug store merchandise through a wholesale 'drummer.' Drummers were salesmen, who traveled about the area, 'drumming up business for their companies. A drummer would arrive in Scottsville by train, spend the night at the Traveler's Rest Hotel on Main Street, and leave by train the next day with Ellison's handwritten order. On the weekend, all of the drummer's orders were turned in to the wholesaler, who packed and shipped each order during the next week via railroad freight. Such freight shipments arrived at Bruce's Drug Store roughly seven to ten days after the order was placed. By the 1930's, the automobile expedited this procedure so that orders could be delivered in two or three days. In today's world (2004), computers handle orders with next day delivery via truck. 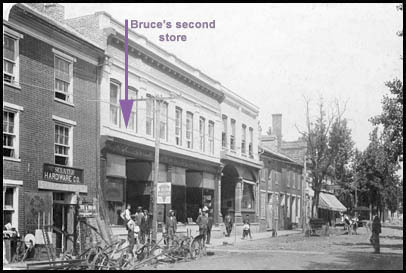 From its early days, Bruce's Drug Store began to fill the medicinal needs of the town's citizens and the country population of south Albemarle, Buckingham, and Fluvanna Counties. Ellison Bruce, and later his son, Tom Bruce, served the needs of the community with a generosity in time and account payments. During the 1930s when money was a scarcity in this predominantly farming area, payments on account to Bruce were sometimes made by barter. When customers were unable to pick up prescriptions, the pharmacists themselves delivered them. In the 1930's, the State of Virginia allowed the sale of alcohol only for medicinal purposes. At Bruce's Drug Store, this sale went on with the required prescriptions. However, the sale of medicinal alcohol became too frequent, and ABC officials withdrew the pharmacy's right for alcohol sales. When Ellison became sole owner of Scottsville Drug Company, he added a small soda fountain. A revolving, hand-turned drum produced carbonated water for soda drinks, and Ellison made ice cream in a hand-turned freezer. Photos of his first storefront show 'Bruce's Ice Cream Parlor' and 'Drink Coca Cola' stenciled on the store's front window. About 1920, Ellison installed an electric-operated soda fountain and ordered his ice cream from a commercial dairy. 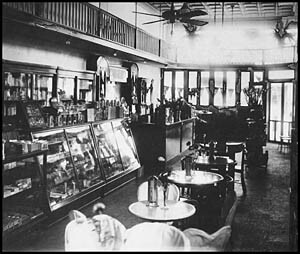 When Bruce's Drug Store moved to the corner of West Main and Valley Streets in 1928, Ellison installed a modern soda fountain with counter stools and tables with ice cream chairs (shown in grand opening photo above). Later Ellison installed two booths, which were popular with Scottsville High School students. From 1930 - 1951, Bruce's Drug Store made its own ice cream, which is remembered by many as the best treat ever. The soda fountain business, however, gradually became unprofitable and was removed from the store in April 1958. Memories of Bruce's Drug Store include its important place in the community for medicines and prescriptions. Citizens of all ages fondly remember 'going to Bruce's' for a soda, ice cream, or just plain good conversation. Druggist Bruce, slight in build, large in friendliness and smiles, would cram a mountain of ice cream into a nickel cone, much to the delight of his customers. As one soda fountain regular fondly recalls, "A great Scottsville memory is going to Bruce's Drug Store for lunch. Some days I forgot about the real food and just got my favorite ice cream cone, a black raspberry triple dip. I have not had such good ice cream since then!" Ellison Bruce operated Bruce's Drug Store until his death in November 1947. 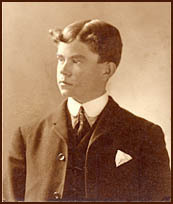 His son, Thomas Ellison Bruce, Jr., took over management of the drug store after his father's death. Although educated as an accountant, Tom, Jr., went back to school in pursuit of a pharmacy degree at the Medical College of Virginia. He completely remodeled the drug store in 1953, installing new fixtures and air conditioning. In 1969, Hurricane Camille flooded Bruce's Drug Store with 8.5 feet of water and James River mud, destroying its interior. Tom again remodeled the drug store and reopened in 1970. Two years later in June 1972, Tropical Storm Agnes flooded Bruce's Drug Store with 12 feet of water. Again Tom remodeled and reopened his drug store. Tom Bruce continued to operate Bruce's Drug Store after the floods and employed another pharmacist, G. Richard Sago, in October 1974. Tom retired in April 1977, when he sold his drug store to Richard Sago and his wife, Ann, who is also a pharmacist. 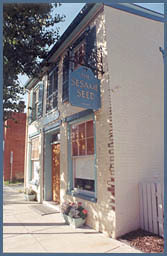 The Sagos operated Bruce's Drug Store at the corner of Valley and West Main Street until November 22, 2003, when they moved the store to its fourth and current location in the old Maxwell Furniture building across from Scottsville Museum on Main Street.